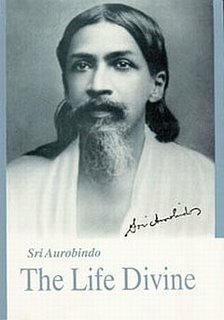 In the first Chapter of The Life Divine, Sri Aurobindo places ‘The Human Aspiration’ to grow, expand and strive to the highest ideals that can be dreamt of or conceived in imagination within the matrix of an evolutionary movement that spirals through the cycles of creation. Each breakthrough in the evolutionary scheme is visualized in the symbol of a dawn of God-Light which is again placed in an eternal succession of dawns immortalized in the Rig Veda verse which Sri Aurobindo quotes at the beginning of first chapter. Sri Aurobindo is naturally not speaking of a mere biological evolution. He is concerned with an evolution in Consciousness and of Consciousness and what Science studies as a biological evolution is only a resultant of the deeper evolution of Consciousness. The evolution of Consciousness that builds the universes with order and precision cannot be haphazard and disorganized. It must be the expression of a pre-programmed Creative Knowledge implicit with a pre-programmed executive Dynamism. In other words the drama of creation is an unfolding progressive evolution of a complex of a “pre-programmed Creative Knowledge and Dynamic Force” that is involved in Matter and laboring to manifest itself in the inertia of terrestrial substance. This complex of ‘Knowledge-Will’ is considered to be representing the attribute of the Spirit in metaphysical parlance. It is described in the 2nd Rig Veda stanza quoted by Sri Aurobindo at the beginning of 1st chapter: “That which is immortal in mortals and possessed of the truth, is a god and established inwardly as an energy working out in our divine powers”. b) The potentialities of the highest movements of the indwelling Spirit can be invoked so as to manifest in the earthly life of imperfection and perversity. This is the raison-de-atre of The Human Aspiration. The 2nd and 3rd chapters of The Life Divine have a common heading-- The Two Negations. Chapter II describes the materialist perspective while chapter III deals with the ascetic position. Chapter II begins with a quotation from Taittiriya Upanishad. It is a stanza that acknowledges the Reality of Matter and yet points out the Reality of the non-material forms of creation. If Matter reflected the Supreme Reality, other forms of the Spirit were equally Real: if ‘Matter’ was Reality, ‘Energy’ was also Reality. The term ‘Energy’ in this Upanishadic sloka does not only denote the mechanical energy sustaining the material universe but also the subtle energies supporting the non-material forms in creation. An evolution in Consciousness (what Sri Aurobindo envisages) can only be meaningful if spirituality blossoms in material life, if there is an unhindered manifestation of the Spirit (the ‘Omega’) in the bosom of ‘inert’ Matter (the ‘Alpha’). The Time–Spirit therefore presses for a new integration that will have a fulfilling effect both in the individual and the race. In the subsequent chapters of the Life Divine, Sri Aurobindo will present the integration of ‘Spirit’ and ‘Matter’ that will proceed through complex and graded pathways. But before that, he wants us to examine ‘Matter’ and ‘Spirit’ in an objective way and to acknowledge the place of ‘materialism’ in the human quest. One great problem of ‘materialism’ is its reliance on ‘sensory perception’ and ‘reason’ not necessarily because of their limitations (which are present and bona fide and will be discussed later) but because the human being has also faculties that transcend ‘senses’ and also can be infra-rational or supra-rational. In fact ‘Extra Sensory Perception’, ‘Near Death Experiences’ and ‘Out of Body Experiences’ are phenomena that contemporary consciousness researchers find difficult to ignore. Likewise, the logical, rational man can also be subject to taboos, superstitions, prejudices or be prey to personality attributes like anger, jealousy, lust, and greed! Or else, a pragmatic scientist can also suddenly be swayed by a piece of ethereal music. A strain of Beethoven’s composition can suddenly uplift a person who was otherwise engaged in share market speculations and lead him to wonder which of the two was a more fulfilling experience! The end result of all these phenomena is that even a ‘materialistic’ person trained to think logically, can get influenced by non-materialistic factors, albeit unwillingly. Such a ‘mixed functioning’ of the intellect can cause confusion rather than clarification to a person who is pursuing knowledge, either in the domain of science or spirituality. In fact, Sri Aurobindo also comments that ‘A certain kind of Agnosticism is the final truth of all knowledge’ (vide supra). Whatever path we follow, the path of science or the path of spirituality – the universe appears as a symbol or an appearance of an unknowable Reality that translates into different sets of value to different mindsets. To the material scientist, it presents as physical values; to the psychologist it presents as vital and sensational values; to the philosopher as intellectual values and to the mystic as spiritual values. Even here, there can be a problem because the scientist can exaggerate physical values out of proportion and the mystic can exaggerate spiritual values out of proportion. Sri Aurobindo prefers a differential yet experiential and integral approach where each thing is put in its proper place and whatever is not knowable by thought can be attained by a supreme effort of consciousness. Throughout the Life Divine, He will be developing this consciousness approach as a theory, a construct and a Yoga. Sri Aurobindo also makes an interesting observation that certain conclusions of materialistic science have a similarity with certain conclusions of metaphysical pursuits. The Vedas and Upanishads in India have an important tradition of Monism – a doctrine that there exists only a Single Reality. The diversity we see in creation is only a manifestation of a Single Reality – a variegated manifestation necessary for the play of the cosmic drama which otherwise would be lackluster, boring and monotonous. Leaped into being, a particle of God. It is the Infinite’s blind minute abode. In that small flaming chariot Shiva rides. Time’s tiny temples to eternity. Of the timeless vastness of Infinity. Science has already changed its conception of matter – to it, Matter and Energy are interconvertible. The Vedic Seers also considered matter to be a conceptual form of substance – so much so that a point can be reached where only an arbitrary distinction in thought divides form of substance from form of energy. In fact, to the spiritual tradition of India, ‘Mind’, ‘Life’ and ‘Matter’ are just different formulations of the same Energy. If so, then this ‘Energy’ is not a brute mechanical force that works through accident or chance but a Cosmic WILL in action – a consciousness applying itself to a work and a result. Or fronting like far poles of Night and Day. Then shall the Spirit and Nature be at one. Two are the ends of the mysterious plan.